You'd be forgiven if you picked up Xiaomi's MiPad 2 and mistook it for Apple's iconic iPad Mini 4. Both tablets share a 7.9-inch screen size, all-metal construction and a 2,048 x 1,536 pixel resolution (or what Apple calls Retina). To mimic Apple's reversible Lightning connector, Xiaomi equips the MiPad 2 with a reversible USB Type-C connector, which should provide power and expansion capabilities to the tablet. Like the iPad, the MiPad 2 doesn't have an expandable SD or microSD card slot, so you'll have to rely on the USB-C port to connect additional storage. However, the similarities end there. Unlike the iPad Mini 4, which runs Apple's mobile-centric iOS operating system, the MiPad 2 can be configured to run either Android or Windows 10. Powering Xiaomi's iPad clone is a 64-bit 2.2GHz Atom X5-Z8500 processor that's part of Intel's Cherry Trail family. Configurations for the MiPad 2 vary based on the operating system you select. The Android version comes with either 16GB or 64GB of storage, while the Windows 10 version will come with 64GB. Memory is set at 2GB with dual-channel LPDDR3 RAM. The MiPad has an 8-megapixel rear-facing camera and a 5-megapixel front-facing camera for video chats. The MiPad 2 is the latest of a number of tablets out of China that copies Apple's iPad design. Tablets from manufacturer Teclast come with similar metal construction, optional mobile broadband connectivity and dual-booting functionality that will allow you to have both Android and Windows on the same device. The MiPad 2 starts at just $156 (£103, AU$215) for the Android version or $203 (£134, AU$280) for the Windows version, which is roughly half the cost of Apple's $400 (£256, AU$551) asking price for the base iPad Mini 4. Xiaomi's clone is slightly heavier and thicker than the iPad Mini 4. 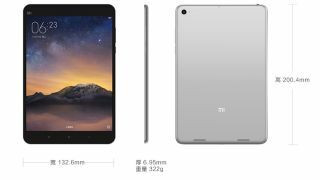 Xiaomi's slate weighs 0.71 pounds (322 grams) and is 0.27 inches (6.95mm) thick, while the iPad Mini 4 comes in at 0.66 pounds (298 gram) and 0.24 inches (6.1mm) thick. The near-8-inch display and metal construction makes the MiPad 2 one of the closest tablets to fill the void left by Microsoft's aborted Surface Mini, an 8-inch tablet that Microsoft Corporate Vice President for Surface Computing Panos Panay said felt like a digital Moleskine notebook. Unlike the much hyped Surface Mini, the MiPad 2 doesn't come with an active digitizer, limiting its appeal to those who rely on inking as part of their business workflow. Before Microsoft scrapped its miniature tablet efforts, the Surface Mini was rumored to debut with an ARM processor and Windows RT, meaning that it won't be able to run full desktop programs. This would make Xiaomi's slate more powerful. The MiPad 2's x86 processor is capable of powering Windows 10 and running full Windows programs.